Welcome to a multicultural journey taking you to a 2 day event of Pop Up shop & fashion talks. 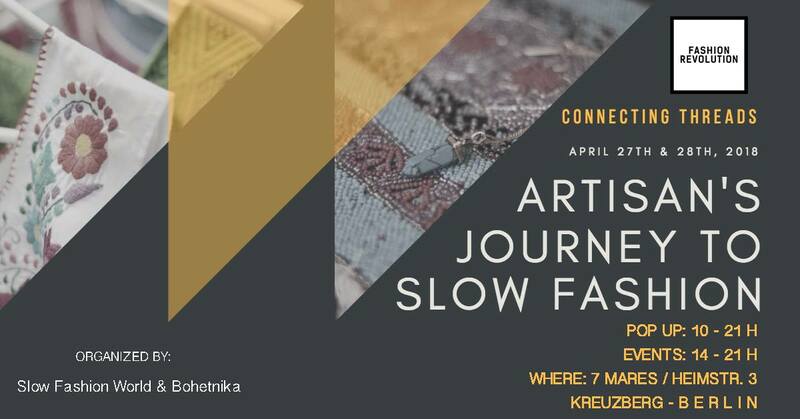 #SlowFashionWorld international platform gathering a growing collaborative community of brands, designers, industry professionals and advocates joining forces to “Get Inspired, Connect with change-makers and get involved” and slow down the fashion industry. Committed to #FashionRevolutionWeek we welcome you to awaken your senses and experience an energetic, positive and exchange experiences. Learn and meet the global artisan communities collaborating with brands to bring long lasting pieces of their culture, history and heritage. What happens during these days? The 2 days event aim to highlight fashion with identity, the art and traditions of artisan communities. To celebrate them, empower and recognize the artisans behind the label. min 1-1 session on how to grow your ethical brand. LOCATION: 7 Mares – The cozy winery space converted to a creative Pop Up event space introducing 10 curated brands from the Slow Fashion World community for PoP UP Special! Meet the brands. Together with #TheRebirthProject #Bohetnika #SusanaNakatani will guide you to from a conscious wardrobe to experiencing the Mexican culture to how technology can bring transparency for social innovation. We are ready to connect you with change-makers from the fashion industry willing to share business and lifestyle tips! 2:00pm “Slow Fashion Meets Diversity” – Mariel Jumpa SFW founder & Moda Doc. América Latina film executive producer. A film directed by Brazilian change-maker Rodrigo Müller on the discovery to highlight and empower the stories behind the Latin America sustainable fashion actors and craft communities. 4:00pm “The creative Legacy of Indigenous tribes” – Yunaira Mendez Venezuelan Biotechnologist & sustainable fashion advocate bringing her roots through textile history and the connection to todays’ fashion. 5:00pm “Empollerando al mundo” – Griela Perez Peruvian Las Polleras de Agus a social entrepreneur working closely with a community of artisans, empowering andean women and men to bring back the art of the embroidery alive from the Peruvian andes. 6:00pm Panel discussion with Lizeth Soto from Bohetnika Cultural appropriation or appreciation? Inviting the audience for discussion. 2:00pm “Conscious Fashion and the power of change” – Upasana founder Uma Prajapati working on various projects to promote artisan weavers, sourcing from farmers growing indigenous cotton, using organic and plant based dyes and developing skills and talent in villages in and around Auroville as well as other cities in India. 3:00pm “Blockchain technology and Sustainable Fashion” –Susana Nakatani founder of Susana Nakatani, a Swedish fashion label that cares about timeless style, solid handmade construction and that has a passion for sewing tradition. Susana has also a strong interest in Blockchain technology and works for KYC-Chain and Selfkey which have developed blockchain-based distributed ledger technology and a series of cryptographic protocols to encourage consumers to entirely own and manage their own identities and data (“Self-Sovereign Identity.” ). 5:00pm “ReBirtH your style” with Elsa Boutaric founder of The Rebirth Project, a sustainable styling platform that helps optimize a wardrobe through a virtual styling session. With ReBirtH, she hopes to help women use more of their clothes and be more creative with their clothing choices to enhance their look and style. ReBirtH has got you covered with the best tips and tricks to keep your style efficient and ethical. 7:00pm Slow Wine sessions (15 min) with the founders of Bohetnika, SFW and ReBirtH. Do you want to grow your ethical business/brand? Ready to exhibit or want to learn on how to create visibility online? (We will be doing give away sessions during the event with 3 entrepreneurs). Free Entry / We suggest to do a donation for the organization and location. 10% will be donated to Fashion Revolution.